When you experience something gourmet, it tends to ruin your taste for lesser cuisines. This is almost the case when experiencing the first of many brief DVD teases this Fall. 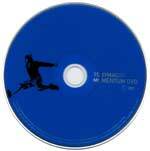 While tobyMac's Momentum DVD project isn't part of the Fall 2002 Collector's Series from Chordant, the DVD is still a small yet plentiful treat for the T-Mac fans. Momentum DVD is a quality peek into the budding solo career of Toby McKeehan - one third of the beloved legends, dc Talk. The DVD collects the three concept music videos for Toby's hit cuts "Extreme Days," "Get This Party Started," and "Irene." Oddly yet uniquely enough, there is also the inclusion of an alternate ending for "Extreme Days" that leaves you without a doubt why it was cut... The clarity of the videos is beautiful, giving premium DVD treatment to some fine looking and colorful videos. Moving right along, brief clips to eight of the songs on his 2001 project Momentum are present. A neat idea, but a rather unnecessary one, this feature is easily dismissable (Now a bonus disc with one full song would have been hot). But the extras on the DVD are the real fun stuff. The photos feature includes about 15 photos with a mix of promos and live concert shots. The live footage is a special treat as highlights from Toby's Spirit West Coast festival performance are shown. The major downside and disappointment here, though, was they substituted the recorded album material over the live backdrop way too often while the live music would have been a lot cooler. It could have been handled a lot better. Nonetheless, it was still fun watching Toby take the fans behind the scenes. With that, the best extra feature is actually the behind the scenes look at the filming for the "Irene" music video. Toby explains several scenes, we see the actual filming, and are introduced to the actors and filmmakers. A definite plus on the project. Finally, a few interesting trailers/commercials for the Momentum album are also included. Momentum DVD is a cool project for the fans of tobyMac's stellar solo debut as it takes the viewer into a more personal glimpse of the artist. While I would have liked to have heard Toby's commentary on the music videos as other projects have included, or been offered more live footage, Momentum DVD isn't meant to be a full-length feature and thus accomplishes what it was set out to do.